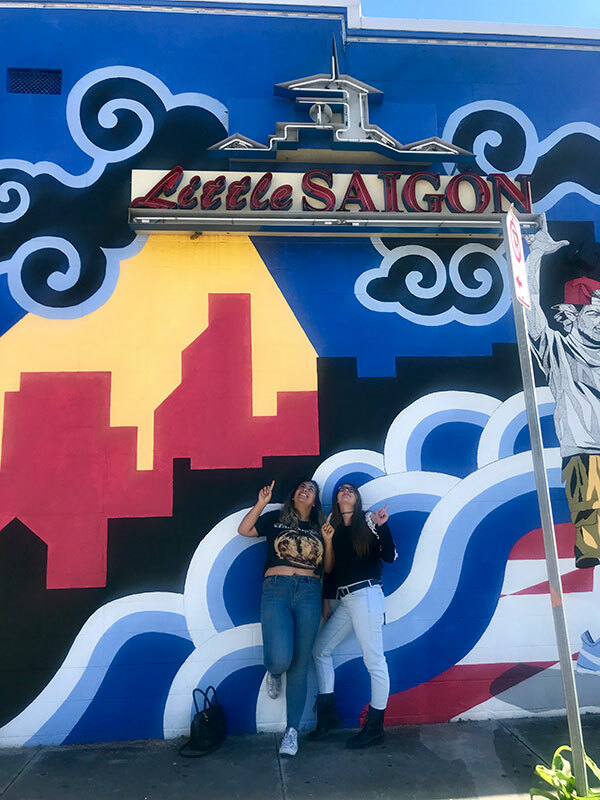 Seniors Miryam Elshaer and Bailey Carter go try "Little Saigon", a restaurant on East Colonial in Orlando, on Sunday, Oct.23. Little Saigon does not traditionally offer many vegetarian or gluten free options but the staff kindly worked with their dietary preferences and gave them many options. Little Saigon is a cute hole in the wall Vietnamese restaurant on East Colonial Drive in Orlando, FL. Adorned with vibrant street art, banners, and plants, the location pleasantly attracts passerbyers. Upon initial entry one is thrust into the past, with certificates and awards lining the door. We were instantly greeted by a kind older man who sat us in an optimal location, with a view of the street and a perfect view of the rest of restaurant. The inside is decorated in anagrammed chairs and plates along with a large fish tank and a photo of New York City. The establishment is shockingly large, more so than you would expect upon initial viewing, yet it gives a very homey feel. When we first opened the menu, as two vegetarians and someone who is gluten free, we were apprehensive. There appeared to only be two vegetarian options along with obscure meal descriptions that left Bailey Carter, our gluten free friend, at unease. However, after speaking to the waiter who initially greeted us, he offered the option of altering many meals by substituting tofu in order to make them vegetarian. This was amazing because numerous restaurants refuse to alter their meals in order to accommodate different dietary preferences and needs. Additionally, when speaking to the waiter we discovered that the restaurant creates all their own broths, allowing Bailey to purchase and enjoy a large bowl of Pho without the worry of contamination. I ordered Pad thai with tofu and Madeline, the other vegetarian, ordered a plate of white rice with broccoli and tofu. The food came out within ten minutes and it was delicious. It was so flavorful and filling, we all left the restaurant satisfied and more than pleased with the service. Little Saigon is an amazing place to dine while on a budget, with cheap prices and large portions, I’d recommend anyone to try it.